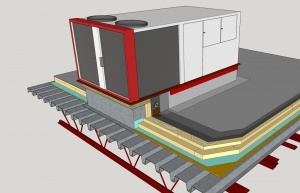 The drawings contained within this section are intended to represent a variety of modified bituminous roof system applications while remaining generic with regards to manufacturers’ specific application specifications. They do not represent all possible manufacturer application roof system designs. Consult manufacturers’ specifications and RoofStar Guarantee Standards to develop a system acceptable to both the manufacturer and the RoofStar Guarantee Program. For further information about SBS membrane system design and requirements, see SBS Modified Bitumen Membrane Systems. NOTE: 'PDF' shown after a file name below indicates a downloadable print sheet is available for Construction Details. Click on the detail link and look for the icon.